For reasons that I’m sure are mainly nostalgia, my favourite gaming platform/era is and probably always will be DOS. PC games have always been fun to revisit over the years partly due to being able to go back and play them with better/different hardware. 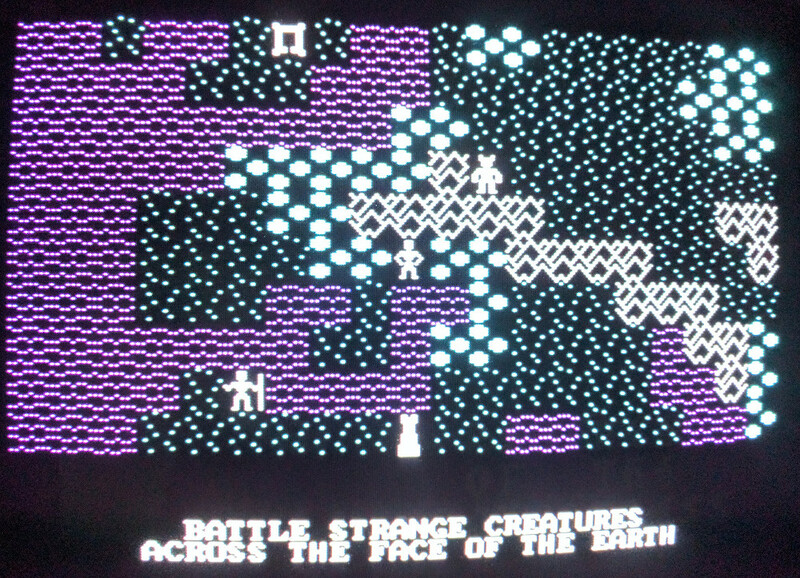 There aren’t many of these technologies I’ve not been able to get my hands on at this point but one I’ve never been able to try out for real has been composite CGA graphics. For those who don’t remember back that far, CGA was IBM’s first attempt at colour graphics dating back to the original PC in 1981. Aside from some rarely used tweaked modes, it allowed for 4 colours at once out of just 4 predefined and garish palettes leading to PC games being notoriously ugly until EGA/PC Jr came along. 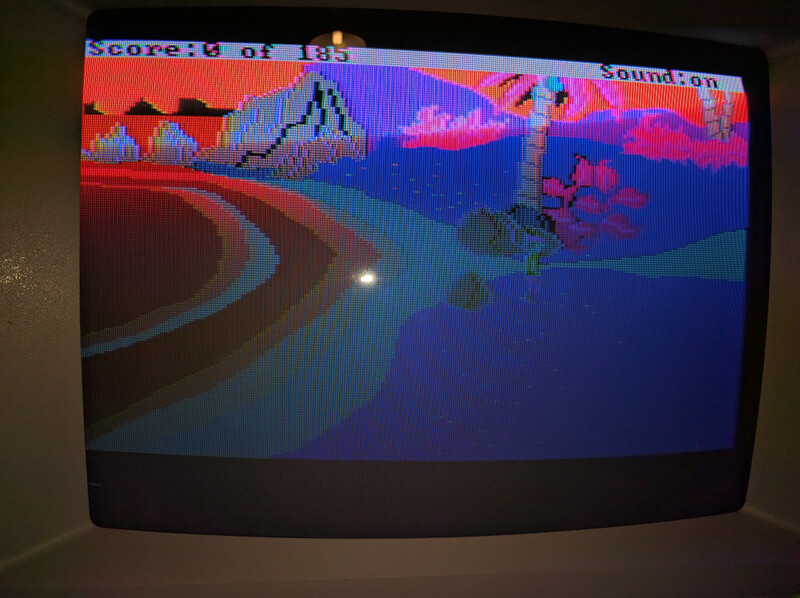 This reputation was not entirely deserved however as many games used a composite mode which through the use of the TV out built into most CGA cards could be used to produce artifact colours greatly increasing the range of colours available. This was in unusually good shape for one of my retro buys as I didn’t want to take a chance on importing something this size. 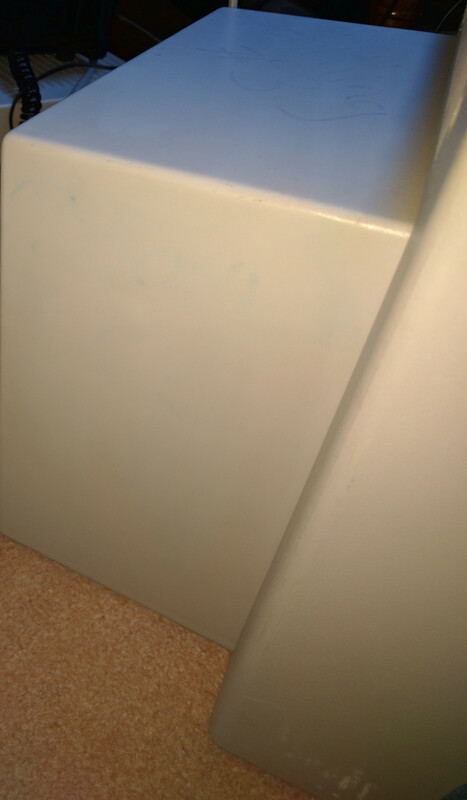 It did of course have a load of writing all over the back of the case. Some isopropyl alcohol (only available at the chemist over here) just about removed it all but the black writing proved stubborn. The more important matter to what it looks like, is does it actually work? The answer so far is sort of. 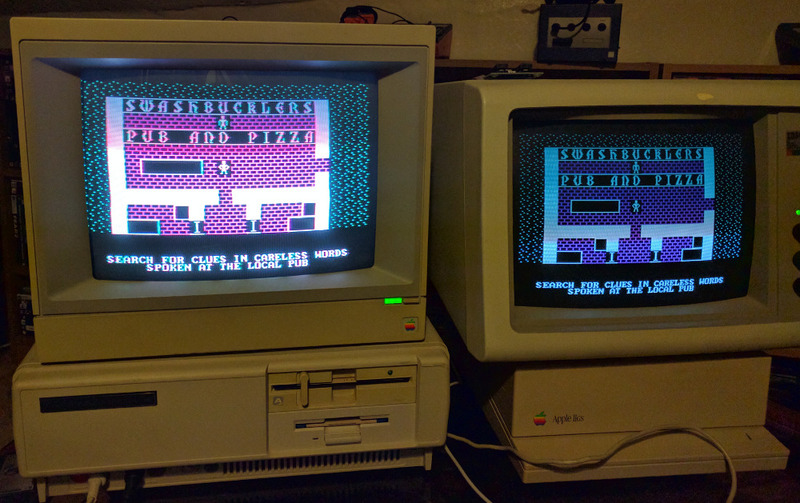 I’ve tried it out with my Tandy 1000 and am able to run both the CGA and composite monitors simultaneously thanks to the dual output. There is definitely extra colour produced. It just isn’t necessarily the right colour. By way of example, Kings Quest 2 above. This is rendered in high res monochrome on the RGB monitor on the right, which is converted into the admittedly colourful but clearly wrong image on the left. These composite monitors do have a tint control which can swivelled around to change the colours but I’m unable to get it to anything sensible no matter what. 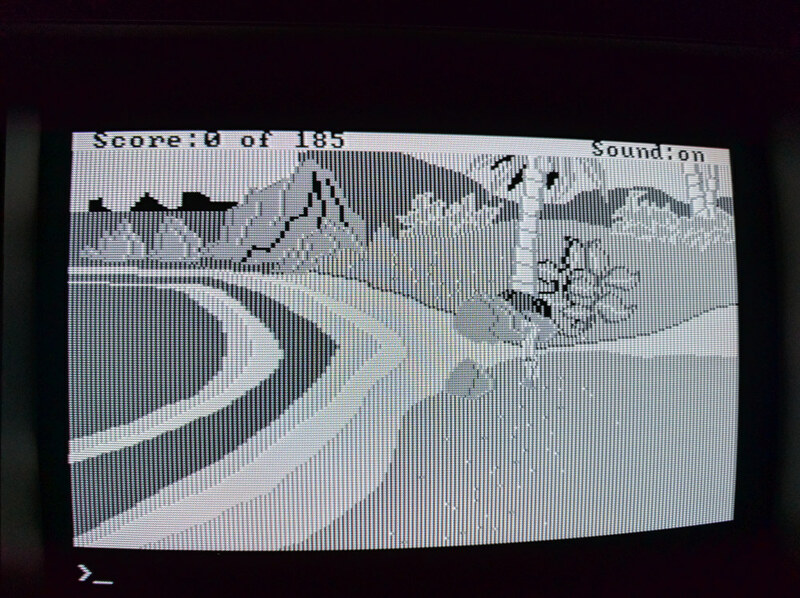 As far I can tell, the problem I’m having is that the Tandy composite isn’t quite the same as real CGA. Apart from the hires mono, the other means of rendering composite colour was to use a standard resolution CGA image with all 4 colours shown as normal and certain combinations of coloured dots would merge together to produce the extra colours. I gather the artifact colours produced this way were more flaky but it did mean you only needed one set of graphics for CGA and composite support. This explains a lot about those garish CGA graphics in early DOS games which were clearly meant to be played in composite. 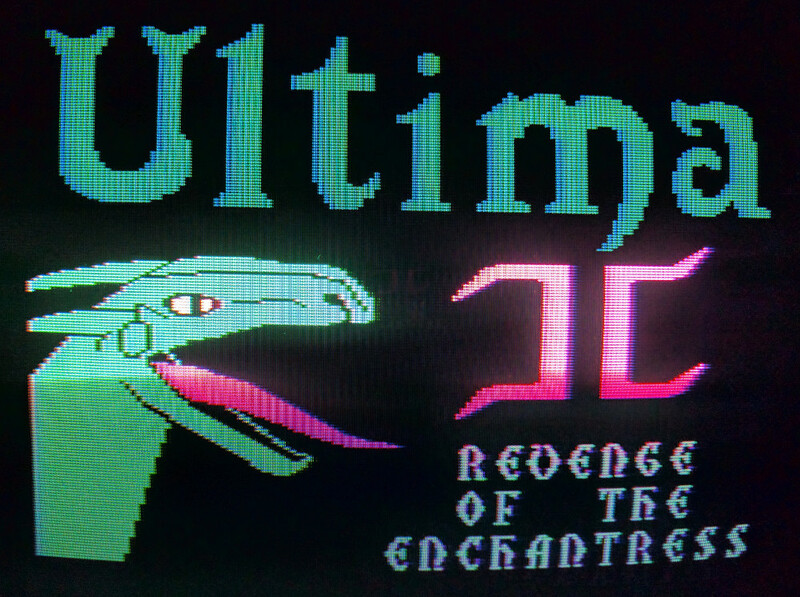 One such game was Ultima 2 which doesn’t look too bad at all on the Tandy in composite, although I’m sure it’s still not quite correct. Here’s a side by side comparison. 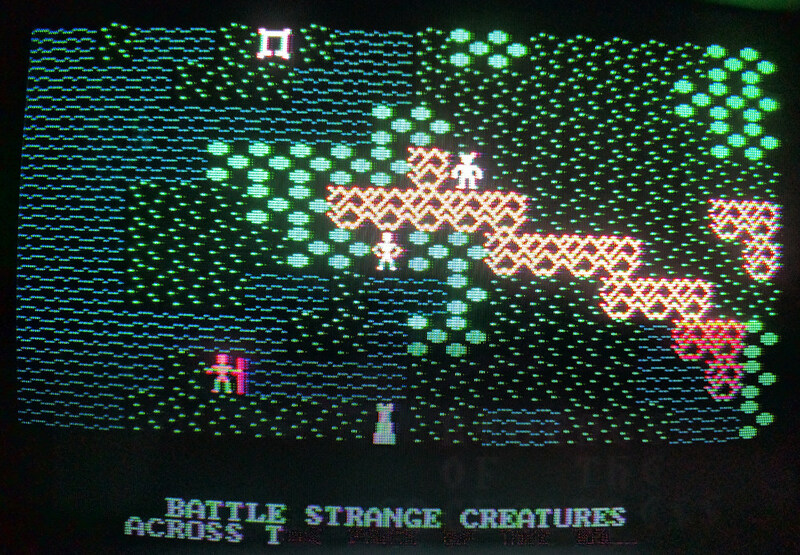 Even on the Tandy, this shows the substantial improvement with blue water, green grass and trees and some of the player sprites look to have hair and clothing. I had originally planned to do a side-by-side video but trying to film this composite monitor simply wasn’t going to happen by phone. Taking photos was tricky enough. I may experiment with other camera apps but I left it for now since I’ve not got this working correctly as of yet. It may be about as simple as PC graphics can get but this thing is an absolute colossus of an expansion card. The original plan was to slip this in the Tandy but it’s so large there is no way it’s getting into the case. Due to the connector design it won’t go in anything except an 8-bit slot either so I can forget trying it on my P2. 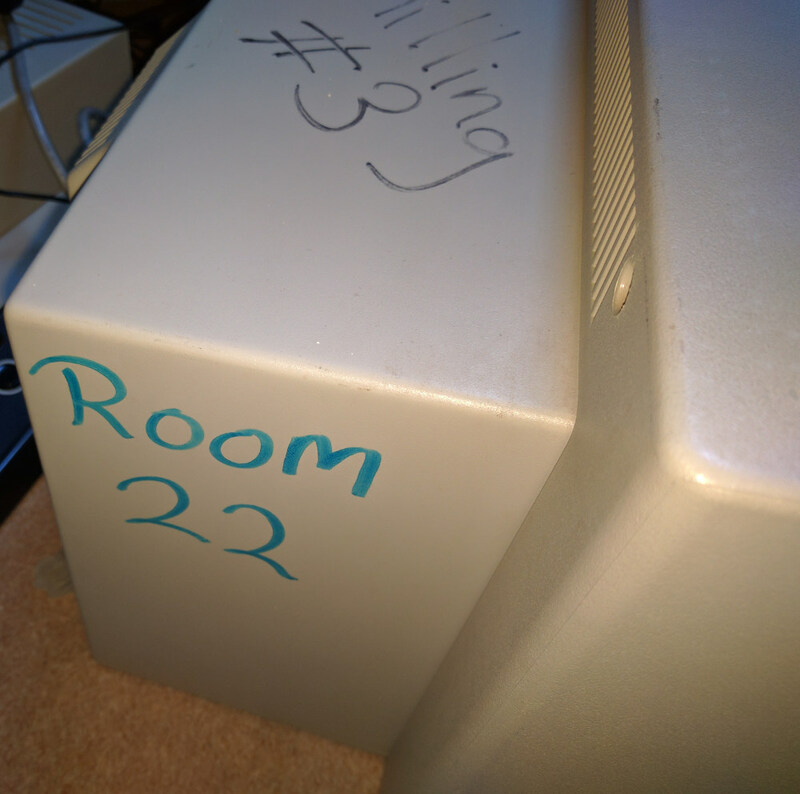 In short, I need another old PC (which I’m sure can be arranged) and I’ll revisit this topic another day. 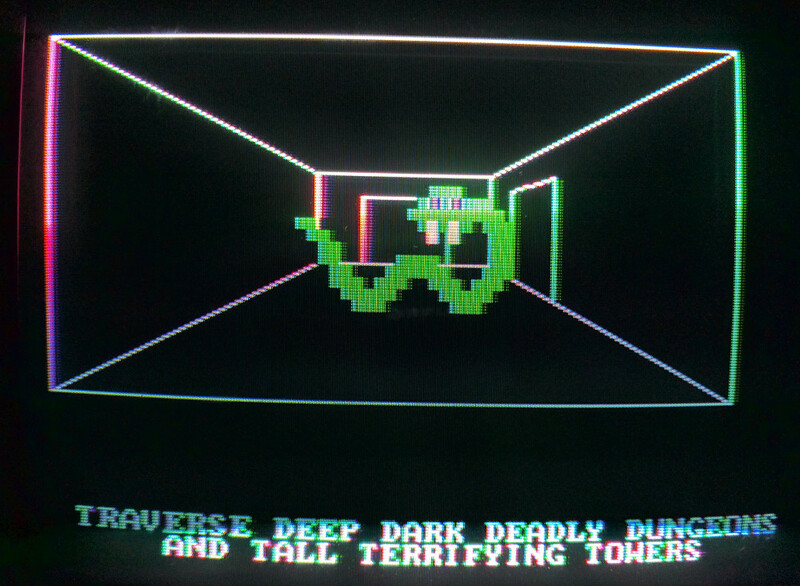 This entry was posted in Off Topic and tagged COMPOSITE CGA, dos by Pix. Bookmark the permalink.